Based on the four movies of the Alien series, is a fully cooperative game with original art. While based on the Marvel superheroes version of Legendary, the two games will be compatible but cannot be fully integrated. Legendary Encounters is a deck-building game in the same family as Legendary: A Marvel Deck Building Game, but now players must cooperate in order to survive against hordes of aliens. Players take turns recruiting cards for their deck from a central selection in order to improve their deck and defeat enemy cards that are added to the central game board. To be released at Essen 2013 ! Launch a campaign to strike back against the evils plaguing Varisia with the Pathfinder Adventure Card Game: Rise of the Runelords – Base Set. This complete cooperative strategy card game pits 1 to 4 heroes against the traps, monsters, deadly magic, and despicable foes of the Pathfinder Roleplaying Game’s award-winning Rise of the Runelords Adventure Path. In this game players take the part of a fantasy character such as a rogue or wizard, each with varying skills and proficiencies that are represented by the cards in their deck. The classic ability scores (Strength, Dexterity, etc.) are assigned with different sized dice. Players can acquire allies, spells, weapons, and other items. The goal is to find and defeat a villain before a certain number of turns pass, with the villain being represented by its own deck of cards complete with challenges and foes that must be overcome. Characters grow stronger after each game, adding unique gear and awesome magic to their decks, and gaining incredible powers, all of which they’ll need to challenge greater threats in a complete Pathfinder Adventure Card Game Adventure Path. The Pathfinder Adventure Card Game is an expandable game, with the first set containing nearly 500 cards. The Rise of the Runelords – Base Set supports 1 to 4 players; a 110-cardCharacter Add-On Deck expands the possible number of players to 5 or 6 and adds more character options for any number of players. The game will be expanded with bimonthly 110-card adventure decks. In Quantum, each player is a fleet commander from one of the four factions of humanity, struggling to conquer a sector of space. Every die is a starship, with the value of the die determining the movement of the ship, but also its combat power – with low numbers more powerful. So a [ 6 ] is a quick but fragile Scout and a [ 1 ] is a slow but mighty Battlestation. Each type of ship also has a special power that can be used once per turn: Destroyers can warp space to swap places with other dice and Flagships can transport other ships. These powers can be used in combination for devastating effects. You’re not stuck with your starting ships, however: using Quantum technology, you can spend actions to transform (re-roll) your ships. Randomness plays a role in the game, but only when you want: Quantum is very much a strategy game. You win by constructing Quantum Cubes – massive planetary energy extractors. Each time you build a new one, you can expand your fleet, earn a new permanent ability, or take a one-time special move. The board itself is made out of modular tiles, and you can play on one of the 30 layouts that come with the game or design your own. The ship powers, player abilities, and board designs combine to create a limitless set of possibilities for how to play and strategies for how to win. Set amid the constant warfare of the Old World, Warhammer: Diskwars is a game of ferocious, fast-paced tabletop battles for two to four players. At the heart of the game’s conflicts are its disks, which represent heroes and units from across the Old World. During the game, you activate these disks, flipping them end over end to move them across the battlefield, position them to attack, and interact with terrain and other disks it overlaps. When one disk covers another disk, the disk on top is considered to be “pinning” the disk below it; this prevents the pinned disk from activating, and at the end of the round, overlapping disks must fight one another. By maneuvering carefully to pin your opponent’s units, you can strike them down, seize control of the battlefield, and win the day! Warhammer: Diskwars has been updated to its new setting within the Warhammer world and features flexible rules for hero-centric army-building. 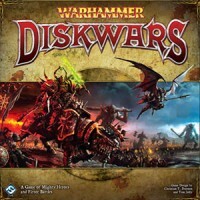 Additionally, whereas the originalDiskwars was a collectible game, Warhammer: Diskwars has moved away from the blind buy model, and the Core Set includes everything you need to play the game: a host of terrain cards, objectives, command cards, and more than sixty disks for the game’s four races. It is a few years in the future and the nations of the world concur with the opinion of an unprecedented number of leading scientists: a combination of overpopulation, environmental change, and resource depletion has put the human species at imminent and dire risk. Something needs to be done – but what? In the span of a few weeks, top advisors and experts in each major world power conclude that the only way their people – and, indeed, all of humanity – will survive is via dramatic and immediate global de-population. With no one wanting to put their own people at risk, it will take aggressive and even inhumane acts to somehow save the world. High levels of social interaction: Much of the game is conducted via face-to-face diplomacy involving all six players. Player determination: This low-luck game forces you to match wits with your antagonists – not roll dice – in order to beat them. Variety: Every game is different thanks to a range of Event Cards that have many different effects on the action. Various types of warfare to choose from, each with their own strengths and weaknesses: You can choose to use Conventional Military or Terror, or even unleash Biological and Nuclear horrors.